Is Potash Corp Worth the Price? 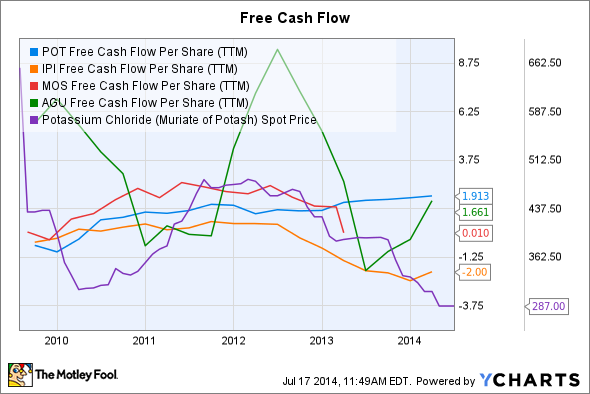 Potash Corp is on the rebound, but its free cash flow shows that the company isn't exactly cheap. The market has taken its toll on Potash Corp (NYSE:POT). As prices fell, the company laid off a significant portion of its workforce, though recently it has reinstated some positions. Now more than ever it is important to look at Potash Corp's free cash flow before betting on its recovery. Potash Corp's share price recovered to $36, as producers in Russia and Belarus have improved their relationship and brought some stability to the market. The good news is that potash prices appear to be slowly stabilizing at more than $300 per tonne. Thankfully Potash Corp's expected 2014 per-tonne cost of goods sold of $125 leaves enough room to pay or other costs. With a per-share free cash flow at $1.91, Potash Corp currently sports a free cash flow yield of around 5.3%. After inflation of 2%, Potash Corp has a real yield of 3.3%. This 3.3% is better than the current yield offered by inflation-adjusted U.S. Treasury bonds, but Potash Corp's ability to grow free cash flow will be limited for the time being. It is only running at 75% of capacity. Intrepid Potash (NYSE:IPI) is a much smaller miner that has seen low earnings due to high costs. Its cash operating costs have been around $195 per ton, leaving a cash margin per ton of $93. To deal with the new low-price environment, management decided to invest in a cheaper production technique that uses evaporation. Thanks to these new operations, management expects to push cash costs down 9.2%. Intrepid Potash's negative free cash flow is understandable. It had little choice but to invest in new operations in order to reduce its cost structure. Thanks to these new operations, Intrepid Potash hopes to start producing free cash flow this year. Though the company is small and somewhat risky, it is working hard to carve out its own portion of the potash market. Mosaic (NYSE:MOS) has substantial capacity and is in the middle of the industry's cash-cost curve. The good news is that Mosaic is using the market turmoil to consolidate. After its CF acquisition it bought some of Archer Daniels Midland's Brazilian assets in order to expand its distribution network. Mosaic's earnings growth will probably be tepid for a period of time. It is one of the biggest potash producers in a well-supplied market with a flat cost curve. Agrium's (NYSE: AGU) free cash flow is volatile, but the company enjoys a diversified income. It does not focus exclusively on the wholesale markets. Potash brought in 14% of Agrium's 2013 adjusted earnings before interest, taxes, depreciation, and amortization, while retail was the largest segment at 43% of adjusted EBITDA. By mixing various crop nutrients and stages in the production process, Agrium is able to limit its exposure to potash's difficulties. It should not be overlooked that Agrium's large nitrogen operations are a strong long-term business. Cheap U.S. natural gas provides the company with a very cost effective feedstock. The company has already hedged up to one-fifth of its 2014-2016 natural gas needs at $3.50 mmbtu. In terms of growth potential, Agrium is currently more attractive than a pure potash play. Potash Corp is throwing off free cash flow at a yield above inflation, but it is starting to get pricey. Mosaic and others have already flattened the industry's cash-cost curve. Consolidation will help to put power back into producers' hands, but it may take a period of time for demand to eat up the industry's slack. Joshua Bondy works in the energy and materials sector. He works hard to bring to light the underlying forces that drive prices and move the market. Why Is No One Talking About Intrepid Potash Stock?